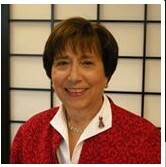 Lynn Goldfarb is the Immediate Past President of the NCJW Southern Maine (ME) Section and currently holds the position of Community Service Chair for the Reiche School Nurse’s Closet initiative. Let’s find out more…. Hometown and Current Town: Lynn was born in Newark New Jersey (NJ) and grew up in South Orange, NJ. She moved to Portland, ME in 1969 and currently resides in Cumberland Foreside. College and Career: Lynn attended Wellesley College as an undergraduate and immediately enrolled as one of just ten women in a class of 500 students at Columbia University School of Business where she received an MBA. Lynn had a very successful career in product research and development at both Lord & Taylor and Maidenform in the New York City area. In Maine, she culminated her corporate career as the first-ever female Vice President at Central Maine Power. Lynn then started her own consulting firm and ran this successful endeavor until retirement. Why NCJW? Lynn’s grandmother was the founding member of the NCJW NJ Section. Upon moving to Maine, the NJ Section President highly recommended that our Section take advantage of her skills and enthusiasm and immediately make her a board member. Wisely, our Section welcomed Lynn on board and since that time, Lynn has served in every position on the board except for Political Action and Treasurer. What Excites you Most about Working with NCJW: Lynn is very proud of the group’s work with Reiche School, The Family Crisis Shelter and with education initiatives focused on heart health and human trafficking. She especially likes that NCJW has allowed her to work with and become friends with women of all ages. In coming years, she looks forward to developing leaders to move the group forward.